VecTor2 is a nonlinear finite element analysis (NLFEA) program for the analysis of two-dimensional reinforced continuum structures subjected to quasi- static or dynamic load conditions. While primarily intended for reinforced concrete, a number of continuum material types (concrete, SFRC, steel, masonry, wood, others) and reinforcement types (mild steel, prestressing steel, FRP, SMA, MMFX, others) can be considered with the built-in material models. VecTor2 uses a smeared, rotating-crack formulation for reinforced concrete based on the Modified Compression Field Theory and the Disturbed Stress Field Model. The program’s solution algorithm is based on a secant stiffness formulation using a total- load iterative procedure, giving it numerically robust and stable performance with good convergence characteristics. Second-order effects such as compression softening due to transverse cracking, tension stiffening, shear slip along crack surfaces, and other mechanisms important in accurately representing the behaviour of cracked reinforced concrete structures, are explicitly considered. Additional enhancements include provisions for the consideration of: nonlinear expansion and confinement, cyclic loading, crack shear slip, rebar bond slip, rebar buckling, and application to repaired/rehabilitated structures. A wide range of material models are available for representing various constitutive responses and mechanisms. The element library includes a 4-node rectangular or quadrilateral element (8 d.o.f. ), a 3-node triangular element (6 d.o.f. ), and a 2-node truss bar element (4 d.o.f.). 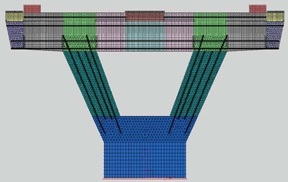 Reinforcement can be modeled either as smeared within the solid elements, or as discrete bars using the truss elements. For modeling mechanisms relating to bar slip and adhesion loss, a 2-node bond link element and a 4-node contact element are also available. Note that the stiffness coefficients for each of the elements available is evaluated explicitly, bypassing the need for numerical integration procedures that can lead to numerical instabilities and prolonged computation times.